Republican recipients of Bobby Thompson's 'dirty money' are happy to keep it. The Minnesota Campaign Finance and Public Disclosure Board (CFB) this week fined the man representing himself as “Bobby Thompson” $21,000 for making seven campaign contributions with a false identity in an attempt to circumvent state campaign finance laws. Now they just have to find him. The contributions were made under the name “Bobby Thompson” and “Maria D’Annuzio” to the Minnesota House Republican Campaign Committee (HRCC), the Republican-leaning Patriot PAC run by GOP political operative Joey Gerdin, the Seifert for Governor Committee, and Citizens for David Carlson Committee, 67B, another GOP candidate committee. The fines were the result of an investigation into a complaint filed by myself with the CFB in July 2010 that alleged illegal campaign contributions by “Thompson.” “Thompson” was the subject of my award-winning investigative series that appeared on RippleInStillwater.com and DumpBachmann.com. The series, largely ignored by the mainstream media, began with the revelation of “Thompson’s” $10,000 donation to Congresswoman Michele Bachmann’s fundraiser in April 2010. “Thompson” had donated tens of thousands of dollars more to Minnesota candidates and party units—all Republican—over several years before going on the lam in the wake of investigations by the St. Petersburg Times and attorneys general in several states. 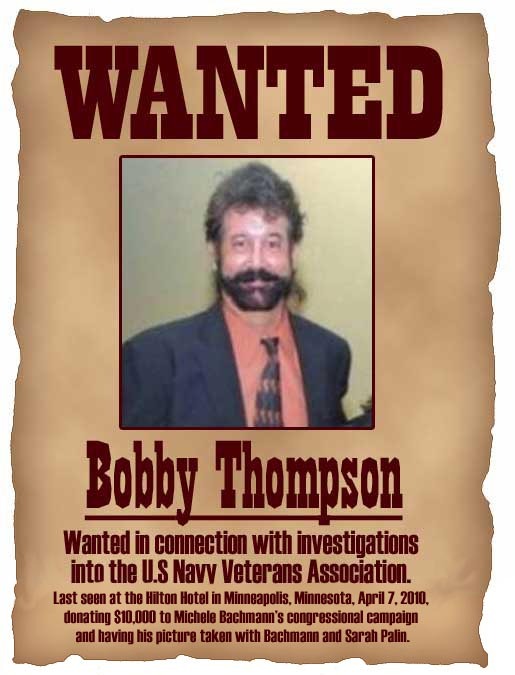 “Thompson’s” suspected phony charity, the U.S. Navy Veterans Association (USNVA), collected over $1.5 million in Minnesota alone over a six-year period from 2003-2009. Nationwide, it’s suspected of hauling in tens of millions more. Money collected under the guise of the USNVA allegedly was funneled to Republican campaigns across the country. The Minnesota Attorney General’s Office has shown little interest in pursuing “Thompson” and his organization, nor in joining other states’ attorneys general in tracking down the alleged fraudster. Attorney General Spokesman Ben Wogsland did not respond to a request for an update on that office’s investigation, if any, into “Thompson” and the Navy Vets group. CFB RETRACES RIPPLE IN STILLWATER INVESTIGATIONThe CFB conducted an extensive investigation of its own and confirmed what my series already had revealed about “Bobby Thompson” and the U.S. Navy Veterans Association: that “Thompson” allegedly ran a sham organization in Minnesota that collected over $1.5 million from unsuspecting Minnesotans using nothing more than a UPS drop box and a forwarded telephone recording for an office. Diane Johnson,, treasurer for the Seifert for Governor Committee, provided the CFB with a copy of a $500 money order and a handwritten note on USNVA letterhead that came with it. The note read “Marty: With my compliments, Bobby.” However, the name on the money order was “Maria D’Annuzio,” a name that the CFB determined was also fake and used by “Bobby Thompson” to circumvent campaign finance laws. Johnson also provided the CFB with a copy of a $500 check to the Seifert for Governor Committee drawn on the personal account of “Bobby Thompson” located in Florida. There is an individual limit of $500 in aggregate donations to candidates for governor in nonelection years. The CFB found that the two $500 donations made to the Seifert for Governor Committee under the names of “Bobby Thompson” and “Maria D’Annuzio” likely came from the same source and thus exceeded donation limits; they also violated Minnesota statutes prohibiting such donations to be delivered (bundled) together. However, it accepted Johnson’s explanation that the campaign assumed the two were spouses and thus the bundled donations legitimate, so it did not levy a penalty for the violation. “The Board recognizes that, with the benefit of this and other investigations, some committees that accepted contributions from the individual claiming to be Bobby Thompson may find it inconsistent with their policies or philosophy to retain those contributions,” it wrote. It noted that Minnesota statutes limit campaigns’ charitable contributions to $100 per charity per year. A central figure in the “Bobby Thompson” money story is Joey Gerdin, who was HRCC finance director in 2008 when “Thompson” made his initial $5,000 donation to the committee. Gerdin is also founder and chair of the GOP-leaning Patriot PAC, which received a $5,000 donation from “Thompson” last year—the largest single donation her PAC received besides her own contributions. Gerdin says “Thompson” attended her fundraiser. Gerdin wasn’t interested in talking about “Thompson” today, however. She hung up the telephone without responding to my request for comment on the CFB findings or the disposition of the $5,000 in allegedly fraudulent campaign contributions her PAC took from “Thompson” last year. Minnesota Speaker of the House Kurt Zellers, chair of the HRCC, and Jenifer Loon, HRCC treasurer, did not respond to telephone and email requests for comment on the CFB findings or the disposition of the $7,000 in allegedly fraudulent campaign contributions “Thompson” made to the HRCC. The CFB’s investigation did not include contributions to the Republican Party of Minnesota through federal political action committees. However, the state GOP received a total of $10,400 from “Bobby Thompson” through committees run by Michele Bachmann’s and Norm Coleman’s campaigns. Deputy Minnesota GOP Chair Michael Brodkorb did not respond to telephone and email requests for comment on the CFB findings or the disposition of the $10,400 in allegedly fraudulent campaign contributions from “Thompson” to the Republican Party of Minnesota. NO HELP FROM THE A.G.
It’s not likely any of the duped donors to the U.S. Navy Veterans Association Minnesota Chapter will ever recover their money, particularly if the Attorney General fails to investigate them. The CFB findings ordered the CFB Executive Director to “monitor other states’ efforts to locate the individual using the name “Bobby Thompson” to make political contributions in Minnesota.” If he’s located, the CFB Director is to work with the Attorney General to try to collect the $21,000 in penalties levied. 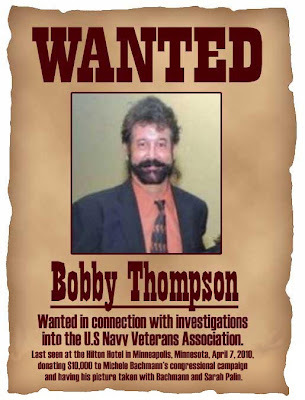 Meanwhile, the Minnesota Attorney General’s Office has refused repeated requests for information about its own investigation—if any—into “Bobby Thompson” and the whereabouts of the $1.5 million he collected from Minnesotans under the guise of a charitable veterans organization. And Republican recipients of “Thompson’s” largess no longer seem interested in talking about him or his money either. Wanted poster graphic by Avidor. Michele Bachmann isn't the only presidential candidate to take money from alleged fraudster "Bobby Thompson"
Besides Michele Bachmann, one other Republican candidate for president can be found on "Bobby Thompson's" contribution list: former Massachusetts Gov. Mitt Romney. "Bobby" kicked in $2,300 to the Romney for President campaign in 2007. IT SOUNDS LIKE A TIP IN THE ICEBERG, IF YOU ASK ME. WHY MINNESOTA? WHAT MINNESOTA NETWORK IS SO INTERESTED THAT STATE REPUBLICANS HOLD AN OFFICE IN HIGH POWER? THE WHO IS LIKELY A WHAT, I'M SURE. THE WHAT HAS A HOLD ON THE MN STATES' ATTORNEY GENERAL, NO DOUBT. THAT'S OBVIOUS, AMONG OTHERS. YOU'RE TALKING ABOUT A LOT OF POWER BEHIND THESE THROWNS. BACHMAN KNOWS. HOW DID SHE GET ELECTED? MOST MINNESOTANS AREN'T IGNORANT PEOPLE. WHY DID THE BACHMAN VOTE TAKE SO LONG TO TALLY? I WATCHED THE POLLS COME IN DURING THAT WHOLE NIGHT. I ASSUMED THAT BACHMAN WOULD NOT BE ELECTED, BUT THE VOTE FOR OUR GOVERNOR WAS THE ISSUE THAT KEPT ME INTERESTED ALL NIGHT. AFTER PAWLENTY, MN NEEDED THE RIGHT MAN IN OFFICE. PLEASE CONTINUE WITH YOUR DILIGENT WORK. HOW CAN I HELP? GREAT JOB! YOU MAY HAVE JUST PUT A CRACK IN THE GREATEST SCAM IN THE HISTORY OF THE U.S.A.
ME THINKS HE DOUST PROTEST TOO MUCH? SOUNDS LIKE THE GOVERNOR OF MN SHOULD STEP IN. IT'S TIME FOR THE TRUTH TO BE REVEALED. I HAVE ONE MORE CRUCIAL QUESTION THAT SHOULD BE CONSIDERED HERE. WHO ARE THESE PEOPLE THAT BACHMAN CONGREGATED AS BEING A TEA PARTY? WHAT PROFILE TYPE DO THEY REPRESENT? 1) DO THEY HAVE ADVANCED EDUCATION? 2) ARE THEY PEOPLE OF MEANS? 3) ARE THEY PREDOMINANTLY CATHOLIC? 4) ARE THEY COMMON LABORERS? 5) DO THEY ATTEND CHURCH? 6) HOW WERE THEY FIRST INSPIRED? 7) HOW WERE THEY INITIALLY ORGANIZED? 8) WHAT IS THE PERSONALITY PROFILE? 9) DO THEY FREQUENT BARS? 11)DO THEY SHARE COMMON INTERESTS? DETERMINING THE FACTORS LISTED ABOVE IS VERY IMPORTANT, I BELIEVE. HOW DID BACHMAN FIRST CONGREGATE WITH THESE PEOPLE? DID SHE CREATE A FOLLOWING BASED ON SELECTION PROCESS? WAS IT A SIGN-UP STRATEDGY? INTERNET FOLLOWING? BACHMAN ISN'T THAT SMART. SHE MAY BE AMBITIOUS, BUT COMMON SENSE? FORGET IT! SOMETHING IS PULLING HER STRINGS. SHE'S A FRONT PERSON THAT BREEDS ON THE GULLABLE, LIKE HERSELF, AND NOT SMART ENOUGH TO GET OUT OF THE RAIN. IF SHE WAS, THE PRESS AND MEDIA WOULD HAVE SENT HER HOME IN TEARS A LONG TIME AGO. SHE'S OBLIVIOUS! SOME CALL HER A WORK OF ART. WHO CREATED HER? THAT'S THE REAL QUESTION, AND AN ANSWER I FEAR. I am very much impressive for the nice info that to helpful info. I had really like it very much. I had really like this info that to using the nice info. Thanks a lot for providing the great info in this blog. This is very much happy for using the great services in this blog and using the great info is visible in this blog. Thanks a lot for providing the amazing info is visible in this blog and sharing the amazing services in this blog. I am frequently visiting the great articles and the amazing services in this blog. This is very much happy for using the nice services in this blog. Thus, being a lean natured and flexible company helps and finance and accounting outsourcing helps the companies to achieve this. Finance and accounting functions, if left to professionals, can help the company to get better results and on top of it cost savings are also incurred since whole department of finance and accounting is outsourced. Quickbooks Enterprise technical Support Phone Number 1800-291-2485. QuickBooks Enterprise is likewise a result of INTUIT, intended to help deal with your bookkeeping and business needs, easily. It handles bookkeeping, finance and installments along highlights like Reporting and Finances, Inventory, Sales and Customers, Purchasing and Vendors and Payroll. The comprehensive designing of QuickBooks also fails in functionality at times, which if not looked into at the right time can have catastrophic consequences to your business. Make sure to Scan your Quickbooks Time to time from Quickbooks Customer Support Number 1888-396-0208 to avoid Errors or corruption. It is a great risk to your business if you lose your important financial data stored in QuickBooks. Dial our Toll free Quickbooks Customer Support Number to take the Help from our Certified Technicians. Thank you so much! Glad to find the information. Is Stillwater the next Wasilla?